Hooked on Needles: Origami Bag - made with fabric! Just the other day, I was poking through some of the sites I follow regularly and Lurline was having trouble finishing what looked like it would be a very cute little origami bag using darling Hello Kitty fabric. I had never made one before and I was intrigued, so I scouted around the internet and found a few sites that offered variations on this same design. 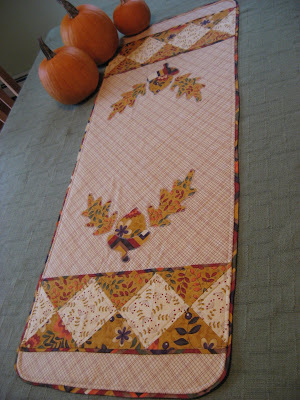 After picking out two fat quarters that I thought went well together, I placed them right sides together and cut them into the biggest square that I could. It ended up being just over 17 1/2 inches square. I pinned all sides and stitched a 1/4 inch seam all around, leaving an opening for turning. Then I turned the little package right side out and, after poking out the corners and pressing all sides, I hand stitched the opening closed. Then I decided which fabric I wanted to be the outside or main fabric, and I folded the square diagonally with my rosebud fabric to the inside. Along the long folded edge of the triangle, I divided the piece into three and drew a pencil line at each of the two marks perpendicular to the fold, up to about 1/4 inch from the angled edge. If I make another bag, I will draw my line to about 3/4 inch from the angled edge to give more of a fold over in a later step. Lesson learned! Then I stitched the two lines. I poked out the corner and straightened up the side seam and pressed it all flat. Then I handstitched the cross-over using a blind stitch so it wouldn't show, making sure the stitching only went through the two pieces that cross over and not the other side of the lining. I did this on both sides, so both outside pockets would be secure. Then I folded down each of the flaps as far as I could. Then I pressed and pinned the folds. This is where I noticed that I should have only stitched those first two lines to about 3/4 inches from the edge at the beginning. Then after dropping my sewing machine table, I used just the arm to stitch a 1/4 inch away from the fold all around the bag. I stitched again about 1/2 inch away from the first stitching to form a casing for the drawstring. I threaded one length of cord through the casing so it came out on the left and I tied a knot to join the ends. Then I threaded another length of cord so it came out on the right and tied a knot. And there's my little bag. It's really quite a clever design with a little envelope pocket on each side, and the large pouch inside the drawstrung middle section. In some of the other tutorials I saw for this bag, the corners have been boxed to make for a more rectangular flat bottom. Also I have seen closures of some sort added to hold the little flaps closed. Buttons, velcro, snaps or any other kind of closure you like could be used. You could also add embellishments to the bag with lace or ric rac or buttons. Beads would look pretty added to the end of the drawstring too. Don't forget to sign up for my 400th post summer giveaway and share it with your friends too! I was scanning the pics and thought I wonder if Lurline saw this! Then I went back and read it. What a CUTE bag. Thanks for the tutorial. Your bag is adorable! I may have to give it a try. Thanks for sharing the directions. 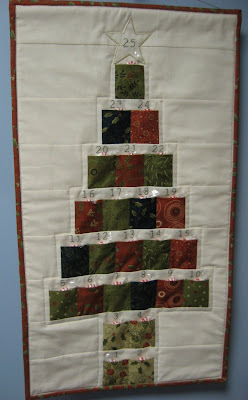 Thanks Mary Grace, I am off to the sewing machine right now - looks good! I fancied the pockets on the inside - will see what I can do! I have been trying to find this "pattern" for years! I wish I could save the instructions as a PDF!